I was trying to install a new screen on my laptop when I realized that it was not as easy as I expected. This screen was huge (compared to my laptop's screen) with a very high resolution (1920x1080) setting suggested. However, with 1920x1080, the only refresh rate available is only 29Hz and 30Hz, which would make my screen looks very flickeringly sharp (I don't even know if it is a word). Updating the driver of my VGA card and the screen doesn't help at all. The fix was surprisingly easy and funny though. I went to the Screen Resolution adjustment, clicked on the "advanced" link. 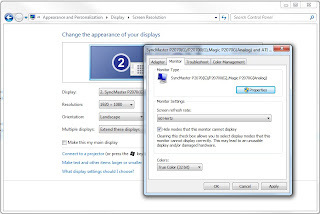 Open the "Monitor" tab, and unchecked "hide modes that this monitor cannot display". The available modes then changed, and I picked 60Hz as the refresh rate. Things went went from that moment on.